New York City, New York is home to perhaps one of the most iconic museums in the world, The Solomon R. Guggenheim Museum – today’s “Museum of the Day”. Located on the upper east side of Manhattan on what is commonly called “Museum Mile” by New Yorkers, the Guggenheim is housed in a building designed by the legendary Frank Lloyd Wright and could be called “the” museum building that is most recognizable as an art museum. 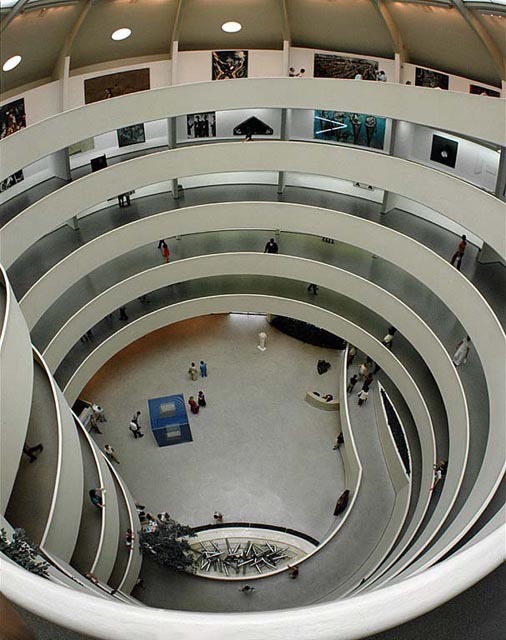 In June 1943, Frank Lloyd Wright received a letter from Hilla Rebay, the art advisor to Solomon R. Guggenheim, asking the architect to design a new building to house Guggenheim’s four-year-old Museum of Non-Objective Painting. The project evolved into a complex struggle pitting the architect against his clients, city officials, the art world, and public opinion. Both Guggenheim and Wright would die before the building’s 1959 completion. The resultant achievement, the Solomon R. Guggenheim Museum, testifies not only to Wright’s architectural genius, but to the adventurous spirit that characterized its founders. Wright made no secret of his disenchantment with Guggenheim’s choice of New York for his museum: “I can think of several more desirable places in the world to build his great museum,” Wright wrote in 1949 to Arthur Holden, “but we will have to try New York.” To Wright, the city was overbuilt, overpopulated, and lacked architectural merit. Still, he proceeded with his client’s wishes, considering locations on 36th Street, 54th Street, and Park Avenue (all in Manhattan), as well as in the Riverdale section of the Bronx, before settling on the present site on Fifth Avenue between 88th and 89th Streets. Its proximity to Central Park was key; as close to nature as one gets in New York, the park afforded relief from the noise and congestion of the city. Nature not only provided the museum with a respite from New York’s distractions but also leant it inspiration. The Guggenheim Museum is an embodiment of Wright’s attempts to render the inherent plasticity of organic forms in architecture. His inverted ziggurat (a stepped or winding pyramidal temple of Babylonian origin) dispensed with the conventional approach to museum design, which led visitors through a series of interconnected rooms and forced them to retrace their steps when exiting. Instead, Wright whisked people to the top of the building via elevator, and led them downward at a leisurely pace on the gentle slope of a continuous ramp. The galleries were divided like the membranes in citrus fruit, with self-contained yet interdependent sections. The open rotunda afforded viewers the unique possibility of seeing several bays of work on different levels simultaneously. The spiral design recalled a nautilus shell, with continuous spaces flowing freely one into another. Even as it embraced nature, Wright’s design also expresses his unique take on modernist architecture’s rigid geometry. The building is a symphony of triangles, ovals, arcs, circles, and squares. Forms echo one another throughout: oval-shaped columns, for example, reiterate the geometry of the fountain and the stairwell of the Thannhauser Building. Circularity is the leitmotif, from the rotunda to the inlaid design of the terrazzo floors. The meticulous vision took decades to be fulfilled. Originally, the large rotunda was to be accompanied by a small rotunda and a tower. The small rotunda (or monitor building, as Wright called it) was intended to house apartments for Rebay and Guggenheim but instead became offices and miscellaneous storage space. In 1965, the second floor of the building was renovated to display the museum’s growing permanent collection, and with the restoration of the museum in 1990–92, it was turned over entirely to exhibition space and rechristened the Thannhauser Building in honor of one of the most important bequests to the museum. Wright’s original plan for the tower—artists’ studios and apartments—went unrealized, largely for financial reasons. As part of the restoration, a 1968 office/art-storage annex (designed by Wright’s son-in-law William Wesley Peters) was replaced by the current structure, designed by Gwathmey Siegel and Associates Architects, LLC. This tower provides four additional exhibition galleries and, some thirty-five years after the initiation of construction, completed Wright’s concept for the museum. In 2001, the Sackler Center for Arts Education opened to the public. Located just below the rotunda, this 8,200-square-foot education facility includes the Peter B. Lewis Theater, part of Frank Lloyd Wright’s original architectural design for the building. Some people, especially artists, criticized Wright for creating a museum environment that might overpower the art inside. “On the contrary,” he wrote, “it was to make the building and the painting an uninterrupted, beautiful symphony such as never existed in the World of Art before.” In conquering the static regularity of geometric design and combining it with the plasticity of nature, Wright produced a vibrant building whose architecture is as refreshing now as it was 40 years ago. The Solomon R. Guggenheim Museum is arguably Wright’s most eloquent presentation and certainly the most important building of his late career. I always make a stop at the Guggenheim when in NYC. It’s not the only landmark building in the city, but it is one of my personal favorites; I always love to see what artist is on display in the rotunda, since the inside perspective is always uniquely interpreted by the artists who are blessed with the opportunity to be featured there. It’s a “not to be missed” museum! Chicago, Illinois – Home to one of the best art collections in the world, the Art Institute of Chicago stands tall in the realm of important art museums of the 21st century. It was voted #1 Museum in United States in 2013 by the TripAdvisor.com users. Close to my hometown of Peoria, I remember many visits to this venerable institution growing up. My most recent trip to Chicago did not allow for a visit inside, but the time I spent exploring Millennium Park allowed me some great views of the new wing. The Art Institute of Chicago collects, preserves, and interprets works of art of the highest quality, representing the world’s diverse artistic traditions, for the inspiration and education of the public and in accordance with our profession’s highest ethical standards and practices. The Art Institute of Chicago was founded as both a museum and school for the fine arts in 1879, a critical era in the history of Chicago as civic energies were devoted to rebuilding the metropolis that had been destroyed by the Great Fire of 1871. Its first collections consisting primarily of plaster casts, the Art Institute found its permanent home in 1893, when it moved into a building, constructed jointly with the city of Chicago for the World’s Columbian Exposition, at the intersection of Michigan Avenue and Adams Street. That building, its entry flanked by the two famous bronze lions, remains the “front door” of the museum even today. In keeping with the academic origins of the institution, a research library was constructed in 1901; eight major expansions for gallery and administrative space have followed, with the latest being the Modern Wing, which opened in 2009. The permanent collection has grown from plaster casts to nearly 300,000 works of art in fields ranging from Chinese bronzes to contemporary design and from textiles to installation art. Together, the School of the Art Institute of Chicago and the museum of the Art Institute of Chicago are now internationally recognized as two of the leading fine-arts institutions in the United States. Nestled in the Basque region’s port city of Bilbao, Spain, today’s “Museum of the Day” is recognizable the world over for the transformational power of iconic architecture and art. 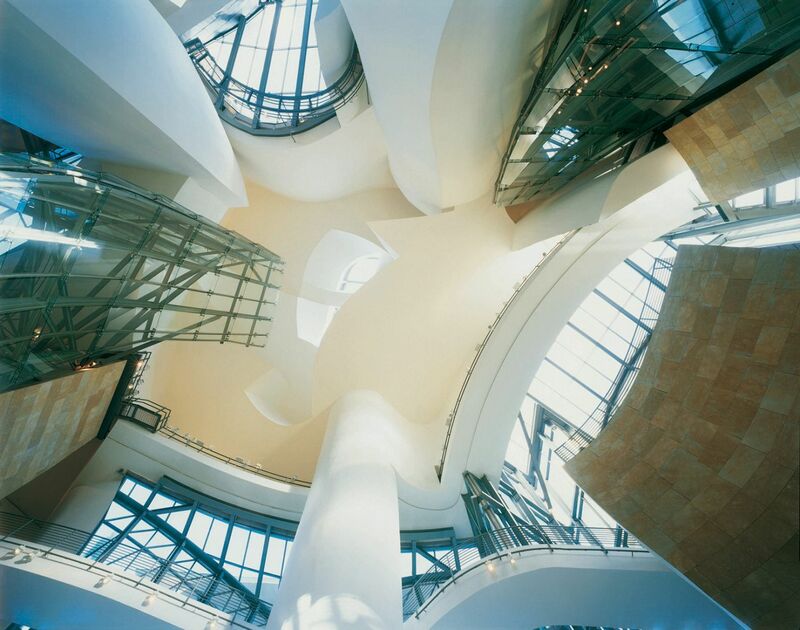 The Guggenheim Museum Bilbao was the real first bold move for a New York-based art collection from the 20th century. The Peggy Guggenheim Collection in Venice, Italy had already been entrusted to the Solomon R. Guggenheim Foundation by 1976, three years before Peggy passed away. Solomon was Peggy’s uncle and when she died, the NY based museum assumed responsibility for the care of the artworks and reopened her palace in Venice to the public as a museum in 1980. Together, the two museums provided a working model that gave Thomas Krens, the New York museum’s director in the 1980-90s, the idea to form a “constellation” of museum outposts in which to circulate exhibits from the existing collections and from which he could enhance the collecting power of the new collective of museums. 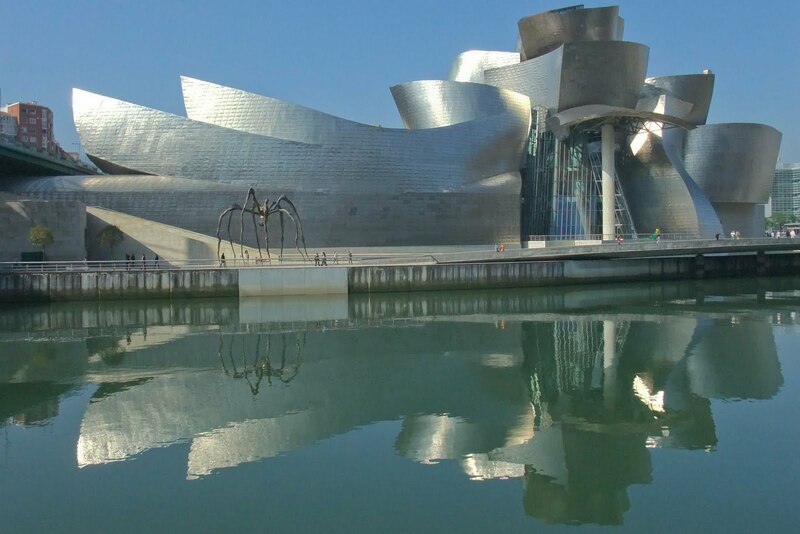 Bilbao, Spain proved a perfect alignment of the stars for Krens and he managed to capture the world’s attention with what many consider Frank O. Gehry’s masterpiece. I wrote my graduate thesis about the museum, and I was fortunate to tour it while under construction (hard hat and all), then again attended the grand opening on October 18, 1987. My experience of seeing it unfinished, I believe, provided me with a lot of insight into how detailed and ingenious Gehry’s designs were. I was able to see closet space for artworks that later, when completed, were completely invisible behind the undulating and sensual walls he designed. When I attended the opening, I was able to understand how he had also worked natural lighting into places that otherwise would have needed artificial lights. The building has a life and an energy force that are palpable from the moment you see it emerge and until you leave. The jaw-dropping, gasp-producing moment when you first spot the museum from a distance continue as you approach it in a car as you round the hillsides of Bilbao, continues at street level, where it looms like a spaceship landed in the middle of an otherwise quiet, historic city. Suddenly, as you approach the museum on the sidewalk, it invites you in with a staircase leading DOWN to the entrance, a huge departure from the monumental staircases up to art museums of the 20th century. The architecture never fails to keep you engaged during the entire visit, as you will find surprises at every turn. I have included many images of the interior spaces here and not the myriad of images from every angle. Instead of explaining each nuance, I leave you with images to explore and enjoy. Truly, the Guggenheim Museum Bilbao has one of the best backgrounds for art of the 21st century, but the best way to experience the building is in person. I cannot wait to go again! 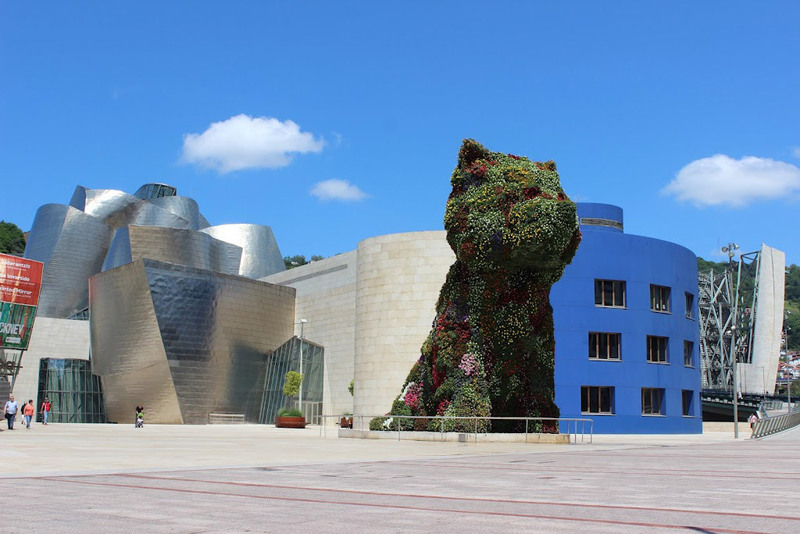 Entrance to Guggenheim Museum Bilbao with Jeff Koon’s sculpture, “Puppy”. 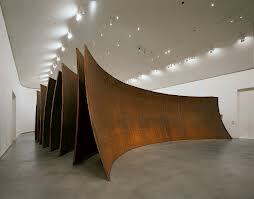 Gallery for Richard Serra’s monumental sculptures. 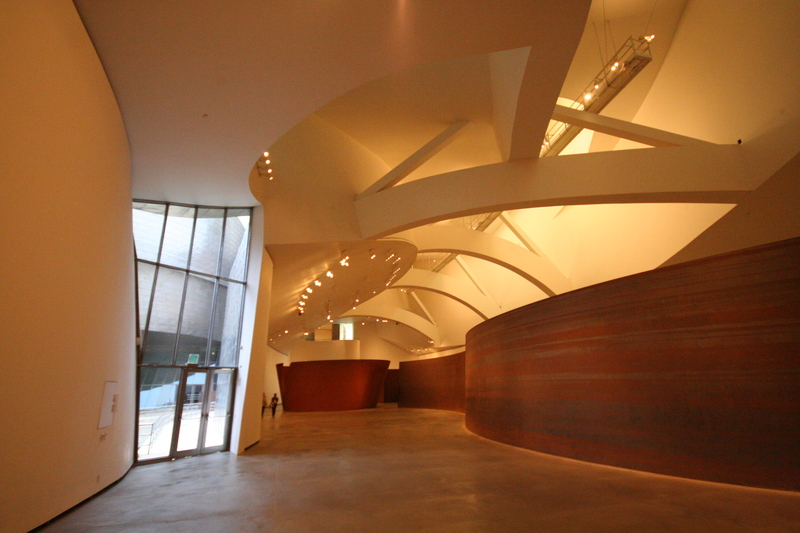 Richard Serra monumental installations are easily experienced in the large hanger-like galleries in the Guggenheim Museum Bilbao. 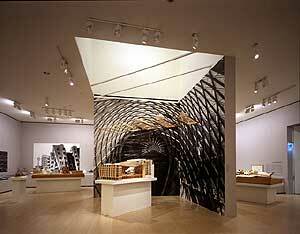 Gerhy’s designs allow for natural light from the upper level galleries to flow unimpeded into galleries below. Kansas City, Missouri is home to the Nelson-Atkins Museum of Art, today’s “Museum of the Day”. As I tour around the United States via the internet searching for this blog, I find all kinds of museums (known or not) that I want to visit! 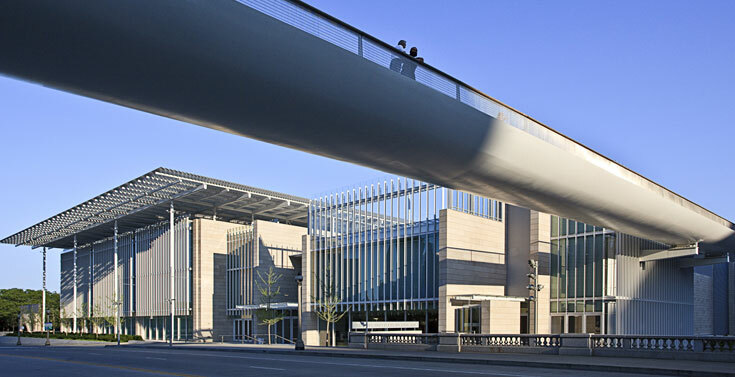 This great art museum in the Midwest has always been on my list, but the new Bloch Building addition that opened in 2007 makes it one of most visually engaging museums, architecturally speaking. The Bloch Building has been called a process unfolding, a magical response to the landscape and to the original building. The design by Steven Holl Architects was chosen for its unique solution to the Museum’s problem: how to provide more space without compromising the original 1933 Nelson-Atkins Building. What was created becomes a sculptural addition to the landscape of the museum. The addition solved the need while adding visual interest to the art museum. The story of The Nelson-Atkins Museum of Art is rich with characters, collectors and curators. It began in the late 1800s and early 1900s, when the edge of Kansas City was still north of the current Museum. It began because a Kansas City newspaperman developed a hunger for refinement at about the same time that a widowed schoolteacher fell in love with the art museums of Europe. The large financial estates they left were intended to create two separate art museums, but trustees later combined their assets to fund what is today a world-renowned art museum, the Nelson-Atkins. It would take brilliant architects, art historians, curators and community leaders to turn the dreams of William Rockhill Nelson and Mary Atkins into reality. Worth the airfare for its history and great collections alone, the museum’s new building is like the icing on the cake. There are many great and unusual museum experiences in Missouri. I can’t wait to visit!